Who is Fethullah Gulen and why is he considered a terrorist in Turkey? Preacher and former imam Fethullah Gulen was born in 1941 in Turkey. By 1981, when he retired, he became one of the most influential clerics in the Islamic world. Gulen’s movement, known as Hizmet, has more than a thousand schools in 180 countries. Until 1999, Gulen was a close friend of Turkey’s current President Recep Tayyip Erdogan, but a conflict between them urged him to flee from the country and move to the US. From that moment, he became Erdogan’s main adversary. Erdogan’s attitude to Gulen even worsened after the 2013 corruption investigations in Turkey, when he accused the preacher of constantly interfering in the country’s domestic affairs. In 2015, Turkey put Hizmet on the list of terror organizations under the name of the Gülenist Terror Organisation (Fethullahçı Terör Örgütü, FETO). In 2016, FETO was named responsible for the July coup attempt. After that, massive purges against Hizmet‘s followers were initiated in Turkey and other countries, including Ukraine. According to the Turkish news agency Anadolu, two FETO educational organizations and a news site Ukrayna Haber operate in Ukraine. In 2016, the news website published an interview with Gulen and became listed as a FETO-linked organization. Attention should also be paid to Ukrayna Haber‘s editor-in-chief and founder Yunus Erdogdu. He was born in Turkey, then moved to Turkmenistan, where he got a degree and became a journalist. In the late 1990s, Erdogdu started to work at the local Zaman newspaper, which promotes Hizmet‘s ideas. In 2005, he became a correspondent for the Turkish opposition news agency Cihan in Ukraine (closed down by the government in 2016) and in 2006 founded the Ukrayna Haber website. According to Yunus Erdogdu himself, he is a Gulen follower. After the failed coup attempt in Turkey in 2016, Erdogdu was accused of having ties with terrorists, and had to settle in Ukraine. In his articles and interviews, the journalist often lashes out at Erdogan and his government and covers the events connected to Hizmet followers. What does Gulen’s movement have to do with the church? Back in 2016, the Turkish media revealed information about close ties between the Ecumenical Patriarchate of the Orthodox Church in Turkey and Fethullah Gulen. In particular, the media focused on good personal relations of Patriarch Bartholomew and the preacher. Then, the information was fiercely refuted but it had already been leaked to the public. For almost two years, there have been no visible signs of FETO attempting to influence religious organizations. However, a peculiar detail has recently emerged. On April 9th, during his visit to Turkey, the Ukrainian President Petro Poroshenko met with Patriarch Bartholomew in his residence in Istanbul’s Fener quarter. The main issue to be discussed was the bestowal of autocephaly (independence) to the Ukrainian Orthodox Church. Turkish media seem to have ignored the Fener negotiations, but it were Ukrainian news outlets that covered the event in Turkish. One of the first news pieces was published at Yunus Erdogdu’s site. The piece, which appeared to be nearly the first among the other news in Ukrainian media, also included photos and a video that had been uploaded to the website of the Administration of the Ukrainian President about an hour before. The Ukrayna Haber‘s and the Administration’s footages seem to be identical but the video uploaded to the news site is about forty seconds longer. We have been unable to find similar footages. Interestingly enough, Patriarch Bartholomew is titled by the author ‘Ecumenical’ while Turkey officially doesn’t recognize this status. 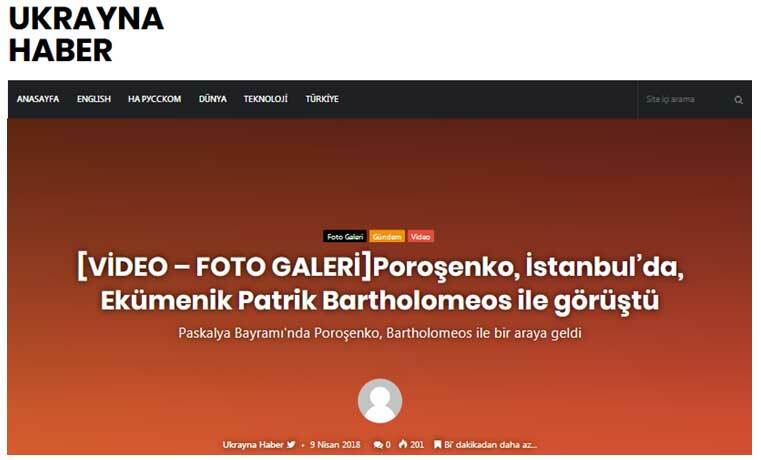 The meeting of Poroshenko and Bartholomew was also covered in the Turkish language by Kirim Haber Ajansi and Ukrturk news sites, but there were just a couple of photos and no video. The Ukrayna Haber seems to have obtained an exclusive footage. Albeit Yunus Erdogdu’s site has published no news on the topic since then, it looks like someone was about to disseminate the information on the visit of Ukraine’s leader to the Fener. If it were Ukrainian government officials, why did they choose such an anti-Erdogan website? And if it were Gulen’s followers, it means they are up to foster the negotiations between Kyiv and Constantinople and have close ties with the President’s Administration. But what can be their goals? Let’s figure this out. What does FETO need the Ukrainian Church for? First, in case Patriarch Bartholomew bestows autocephaly to the Ukrainian Church, Gulenists will preserve and expand their influence in Ukraine through the Ecumenical Patriarchate’s structures and the newly-created Single Orthodox Church. The religious organization will require staff, and it’s a perfect moment to promote their own candidates. Second, the Ecumenical Patriarchate will obtain a source of income not linked to the US or FETO and raise its status in the Orthodox world and Turkey. The Turkish authorities will have less opportunities to track down financial flows to the Fener and gather additional evidence of the ties of Gulenists and the Patriarchate. Here is another detail that draws attention. For a long period of time, the Ukrainian authorities were unable to convince the Fener to bestow autocephaly to the UOC, but for some reason now Bartholomew gave his consent. FETO may have facilitated Kyiv’s efforts in exchange to the safety of its structures in Ukraine. There is also a possibility of the involvement of US intelligence agencies, which are said to be behind FETO. They could be supplying Gulenists with information on the Ukrainian Church issue to let them design a strategy and derive as much as possible from the situation. 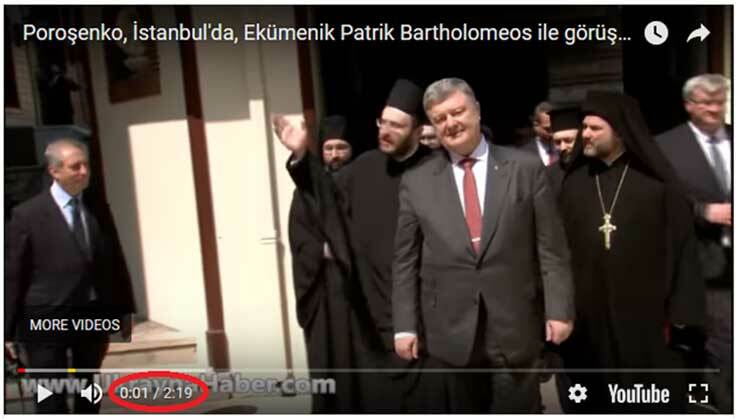 FETO’s interest in expanding its influence, its ties with the Ecumenical Patriarchate, a news piece with exclusive footage at a pro-Gulenist site – everything hints at the involvement of Fethullah Gulen’s organizations in the Ukraine Church issue. However, there has been no direct evidence of a confederacy of the Ukrainian authorities, Gulenists and the Ecumenical Patriarchate, and their roles are a mystery to unravel. *Nadia Bazuk, Freelance journalist from Ukraine with a MBA degree. I don’t know a seriously flawed article like this can be published. The whole argument is based on a 40 second difference between two videos posted to YouTube. The author uses this difference to build up a huge controversial theory that would likely touch people’s lives, mislead on international relations, may be even put certain people in danger because of the sensitive issues involved. What is interesting is that the author does not bother to go and talk to the main subject of the article and learn how he got the video that he posted. We are talking about the same exact video that was first published by the Ukrainian gov’t and used later by a news website. It is that simple: you first go and talk to the person and get his response and put it in the article. Everyone should be careful when writing about sensitive political issues and place certain individuals in the center of things without hard proof.